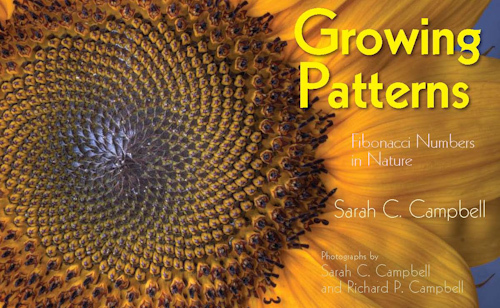 The American Library Association’s 2011 Notable Children’s Books list is now final and I’m thrilled to say Growing Patterns: Fibonacci Numbers in Nature is on it. Thanks, committee. I am so glad that librarians and teachers are embracing my book. I’m looking forward to seeing teachers and librarians this spring at the National Science Teachers Association Annual Conference in San Francisco and the Fay B. Kaigler Children’s Book Festival. I’m also adding dates for school visits. Please get in touch soon if you’d like me to come to your school during the spring semester. I love visiting schools in days after state testing when students are really hungry for creativity and color … and someone who is NOT a teacher. Congratulations to you and Richard. Congratulations, Sarah. What an honor! I was doing research on literacy and summer learning and came across book lists and honors and thought, I bet Sarah’s books are on these lists, so checked, and sure enough–found them! Wow! I know somebody whose books make the lists I try to get our students to read in their summer reading program!! Thank you, Rhoda. I have to keep pinching myself. I never dreamed it possible.